Cook the noodles according to package directions, then drain and rinse with cold water. Rub the salmon with the oil, and season well with salt and pepper. Heat a dry skillet over medium heat, then add the salmon. Cook until browned and flesh flakes easily with a fork. Remove from heat. Flake the salmon into large pieces with a fork, removing any bones in the process. 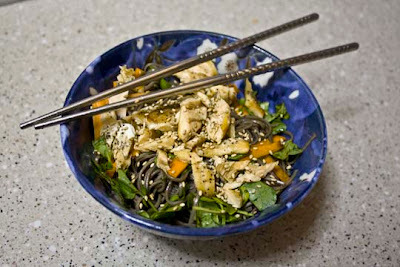 Mix the watercress and carrot into the noodles, and put into a serving bowl. Spread the salmon pieces over top. Mix the soy sauce and lemon juice together, and pour over the top of the fish. Sprinkle sesame seeds over the top and serve. I needed something fast for dinner so I tried this. It was delicious and easy.I'm so glad you can go to school and cook. Thank you! I'm glad you gave it a try. Yes, I don't always have oodles of time to be cooking, but I still like stuff that tastes good, so I try to keep my recipes as quick and easy as possible. I just bought some soba noodles at the store yesterday. I'm going to try this and also the cold soba you posted previously.